Prices will start from £13,755 for the Renault Twingo GT and from £12,205 for the Dynamique S.
The start of December marks the arrival of the Renault Twingo GT and Dynamique S, which are available to buy for upwards of £12,205. The £13k-plus GT will become the city car’s hottest model thanks to a souped-up version of the three-cylinder turbocharged unit currently found in the standard Twingo. New engine mapping and a revised air intake means that the newly-upgraded engine can deliver 125lb ft of torque and 108bhp. These figures mean that the new Renault Twingo GT will produce 19bhp more power than the most powerful model in the existing range, together with 25lb ft more torque. The GT also benefits from new gearbox ratios which will help to boost response times and Renault claims it has a 113mph top speed and a 0-62mph time of 9.6 seconds. The manufacturer is also claiming that the response times of the engine are up there with the best in the Twingo’s class thanks to the car’s ability to jump from 50 to 75mph, for example, in under nine seconds. The model’s chassis settings have been tuned by Renault Sport, as has the variable-ratio steering in a bid to improve agility. Renault also says that the Twingo’s ESP (electronic stability programme) has received new mapping to offer more dynamic handling. The styling is believed to take its inspiration from the 2013 TwinRun concept thanks to its exterior stripes and the GT gets 17-inch alloys and a twin exhaust to highlight its sporting credentials. The GT is expected to become a rival for the Smart ForFour Brabus and it features a larger anti-roll bar and stiffer shock absorbers. The ride height is also 20mm lower than the standard Twingo. The GT is the range-topper in the Twingo line-up, with additional equipment including automatic wipers and lights, climate control, cornering lights and reverse parking sensors. There are also a range of safety and assistance features included, such as cruise control, hill start assist and automatic emergency braking. Other features of the new Twingo GT include Renault Sport badges on the door sills, a metal gear knob and aluminium pedals. There is also a choice of four exterior paints, including a unique orange. The other options are Crystal White, Diamond Black and Lunar Grey. 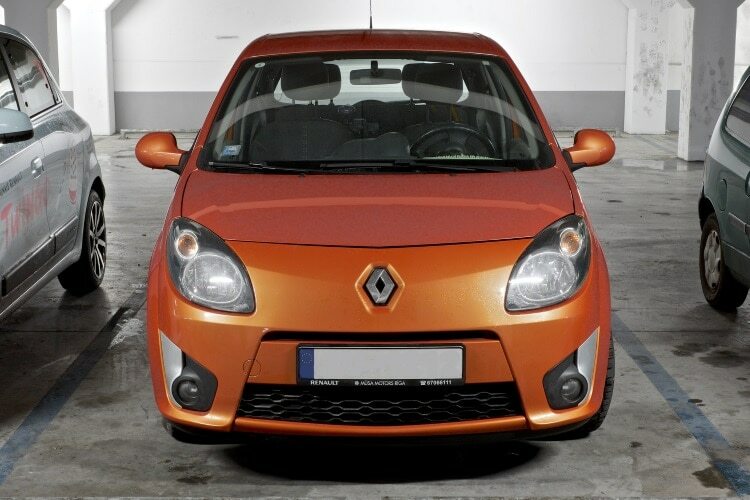 The Renault Twingo Dynamique S replaces the current model which shares its name and sits below the Twingo GT in the range. Prices start at £12,205 and there is a choice of two different spec 898cc engines; one turbocharged which delivers 89bhp and a naturally-aspirated choice, delivering 69bhp. Buyers can choose to pair these with a dual-clutch six speed automatic gearbox or a five-speed manual. The fastest version of the Dynamique S is the TCe 90 which can reach 62mph in 10.8 seconds. The most efficient is the SCe 70, which Renault claims can manage 67.3mpg and emits 95g/km of CO2. Dynamic S models have 16-inch diamond cut alloys as standard, together with part-leather upholstery and aluminium pedals. There is also the option of extra-tinted windows, GT bodywork, parking sensors, and automatic wipers and lights. The Dynamic S Exterior Touch Pack offers front grille stripes, coloured door mirrors and side door strips, in addition to the 16-inch alloys and the Sport decals. The GT’s body kit can be added for £250. The inside of the Dynamique S mirrors the GT’s cabin and is finished in grey with the Interior Touch Pack.